Compact all-in-one systems obviously have their place. After all, the biggest hurdle to most households pursuing their home cinema dreams is the amount of space taken up by dedicated full-sized speaker systems. But there's also a problem with the majority of compact all-in-ones: they sound awful. This is really no more than you might expect, as basic scientific principles suggest that to get a 'big' sound from a speaker, that speaker needs to be big as well. But today those brainiacs at Pioneer appear to have ridden roughshod over science to deliver a truly compact all-in-one home cinema package, the DSC-363, that sounds anything but rubbish. The first thing to say about the DSC-363 is that it shuns the current vogue for 2.1 systems in favour of a full 5.1 speaker package. So it should be able to deliver a true surround sound performance. However, the 5.1 speaker package on test here really is remarkably unobtrusive, thanks to the cubic front and rear left and right speakers measuring just 100mm down each side. And the centre speaker isn't much bigger either. The subwoofer, by comparison, is quite butch, but it can, of course, be easily tucked away out of sight behind a sofa. In an ideal world the satellite speakers would have been a touch prettier, seeing as essentially they're just black boxes. Having said that, their sheer smallness will still make them hugely appealing to many households. The main DVD receiver unit, meanwhile, is a very attractive affair, and plays host to a pleasing number of features to boot. Not least among these is the ability to upscale your DVDs to either 720p or 1080i through an HDMI output. Admittedly, there's no 1080p, but then this would be asking a lot of a system costing just £300. Another handy touch is a surprisingly comprehensive suite of picture adjustments, including gamma and chroma level options which, provided you use them carefully can be used to make genuine improvements to LCD TV and projector pictures. The disc player, meanwhile, can spin MP3, WMA, iTunes AAC, JPEG and DiVX files as well as DVDs and CDs, and the system even provides a USB port so that can play files from USB storage devices too. That's not to say, though, that the 363 gives you all the connections you might require. For audio inputs comprise just a single, analogue audio input, limiting the amount of secondary kit that could take advantage of its surround sound capabilities. There's no digital audio inputs either, meaning you can't pipe in Dolby Digital 5.1 bitstreams from, say, a Sky+ box. Getting back to things the 363 system does do, we find an unusual option whereby you can, if you wish, arrange all of the speakers in front of you, rather than putting the rear satellites behind you. Then 'Front Stage Surround Advance' audio processing can be used to deliver a pseudo-surround effect without the hassle of having to accommodate wires running all around your room. As you'd hope with an AV system that's likely to be targeted at home cinema novices, the 363 really couldn't be easier to set up and use. Colour-coded cables and connections make it practically impossible to hook the speakers up incorrectly, the onscreen menus are clean and concise, and the remote control makes a better fist than most of handling the system's multiple functions. Compared with most all-in-one home cinema systems, the picture quality from the 363 is a revelation. In standard mode, using no upscaling, DVDs look remarkably vibrant, packed with sharpness and detail, and full of contrast and dynamism. Even better, there's practically no sign of any MPEG decoder noise such as background 'twitches' or overt blockiness. Stepping up to 720p and 1080i upscaled images, the 363 definitely adds more detail to pictures without, crucially, introducing anything like as much smearing or noise as we see with upscaling systems on many other budget systems. In fact, the 363's upscaling wouldn't look out of place on a £200-£300 standalone upscaling DVD player. Although it's only fair to give the 363 a four for sound when you're thinking about all-in-one systems as a whole (including full-sized ones), it's superb by the standard of rival compact offerings. Those diminutive satellite speakers produce logic-defying levels of volumes and terrific amounts of fine audio detail, and distribute their output around your room to truly immersive effect, without making you too aware of each individual speaker's physical point in the soundstage. What's more, despite their diddiness, the satellites have enough frequency range to meet and blend almost flawlessly with the rumbles from the big subwoofer, reinforcing the sense of immersion we described earlier. 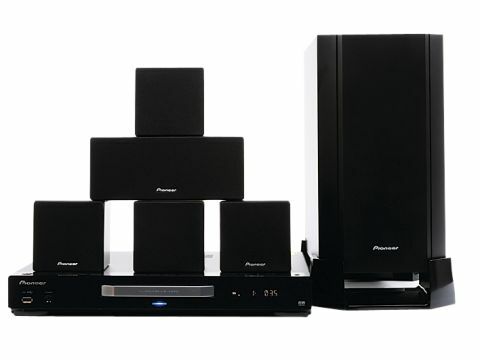 How Pioneer has managed to combine so much AV quality with a price of just £300 is beyond us.